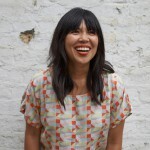 Behold, our latest instalment in Ladyland’s new series: A Perfect Day. It’s all about getting the local lowdown on a city so you can have a great day out. 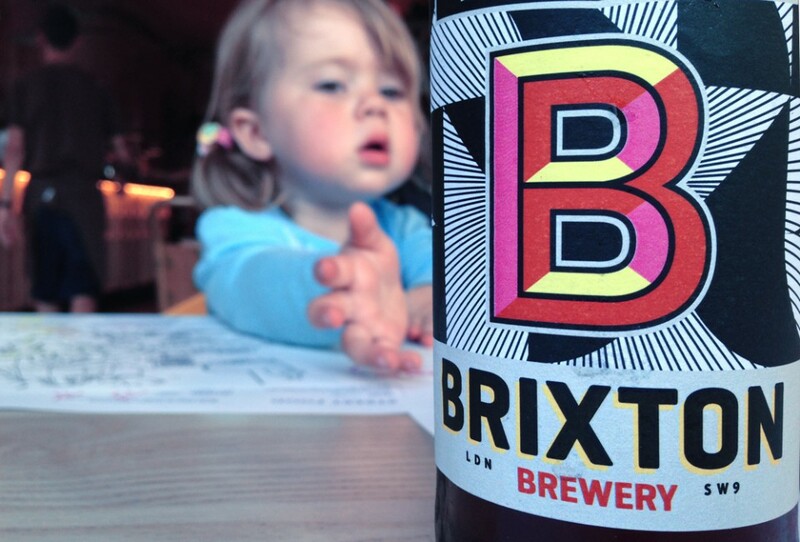 This time, semi-professional baby wrangler Selina shares her perfect day out with a bubba in Brixton, South London. 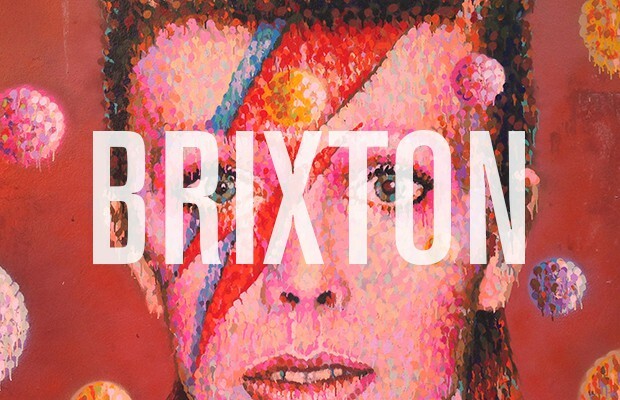 A curious mix of gritty South-London scenery, old-school market traders, quirky characters, cool eateries and unique little shops, Brixton is one of my most favourite places in London. It’s a borough with baggage, of course – it will always be known for the riots in the early 80s that sparked a strong civil rights movement in the area, especially Electric Avenue which was immortalised by Eddie Grant’s hit of the same name in 1982. It’s also the birthplace of David Bowie! There’s much to love here, especially its rich multicultural community and all the life it brings to the area. Sure, Brixton has undergone huge transformations and you’re likely to spot more than a few Bugaboos there by day, but us mums are partial to a bit of blaring reggae music too, you know. 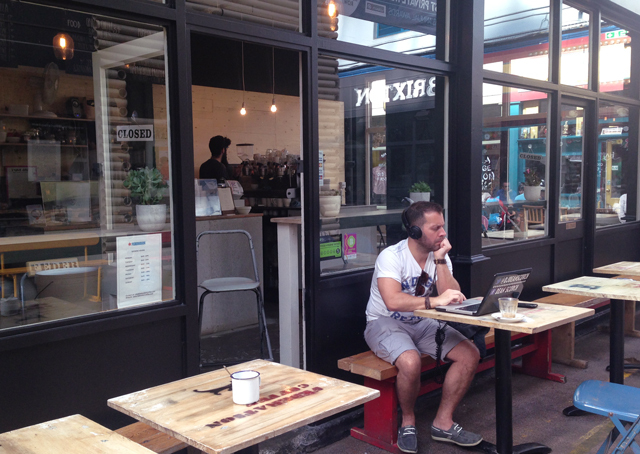 This is basically where I whiled away my maternity leave, hitting the Ritzy for the mums and bubs cinema session and mooching around Brixton Village indulging in excellent coffee, superb street eats (oh how I miss Maureen’s roti) and the occasional round of stealth shopping. Exit the tube and turn right, this will take you to the intersection with Atlantic Road, turn right and cross the road, keep walking past the shops and market stalls until you get to the entrance to Brixton Village. Take a stroll in here where you’ll soon find Federation Coffee. Okay call me biased, but the best coffee in London comes from cafes run by Aussies and Kiwis: Allpress in Shoreditch; Bullet Cafe in Wandsworth; Federation Coffee in Brixton Village. The beans are roasted a hop skip and a jump away, and their standard double-shot serves pack a punch. The amazing baked treats are on high rotation, so don’t get too attached to your faves; luckily the cheesy Croque Monster and corn fritters look like they’re here to stay. If you’re braving it with a buggy, there’s enough room to park by one of the outdoor seats, if you pick the right one; don’t even attempt going inside if you aren’t using your Ergo or some such. The Ritzy is back on the High Street on the big intersection opposite the Town Hall, KFC and McDonalds. 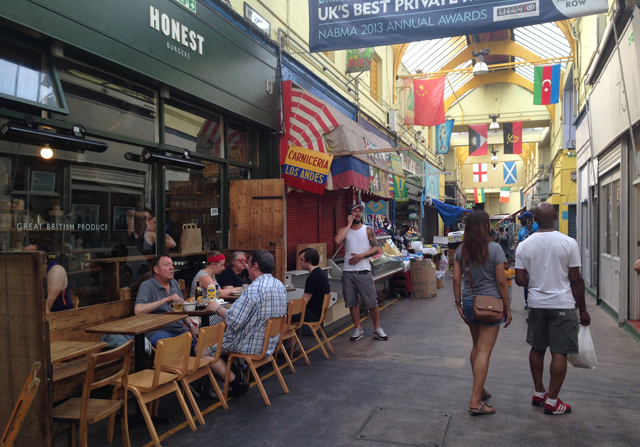 The best places to eat are in and around the two market arcades Market Row and Brixton Village, enter from Coldharbour Lane, Atlantic Road, Electric Avenue and Pope’s Road. Lunching at Franco Manca’s is a bit of a lottery – after leaving the Ritzy, head down Electric Avenue (yes, the Electric Avenue) past all the fruit and veg stalls to Brixton Market, where you can try your luck for a table with parking space for a buggy. If you’ve hit the jackpot, you can enjoy a spectacular sourdough pizza (and maybe a glass of organic Chianti) for a steal. Baby-led weaning bubs love Franco Manca’s pizza crusts: they’re soft, chewy and easy for little ones to hold onto and get into: yes, you’re sharing that pizza, technically not scoffing it all yourself! On the corner of Atlantic Rd and Electric Lane. 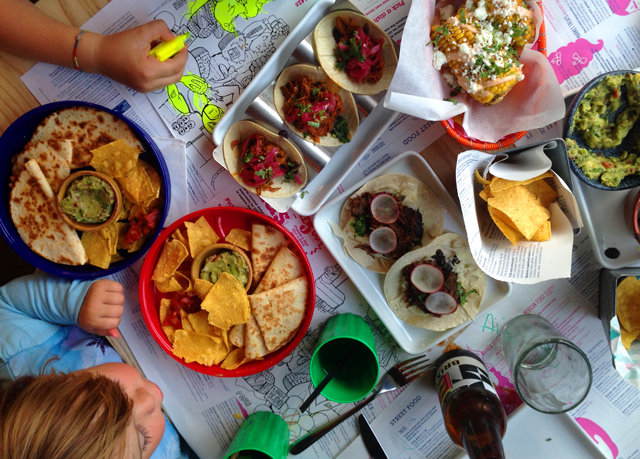 This Mexican joint ticks all the boxes: fab food, colouring in for the kids, drool-worthy decor and, wait for it: room for buggies, high chairs, a kids menu and nappy changing facilities! Okay, perhaps curry goat isn’t that baby-friendly, but you don’t have to share everything. 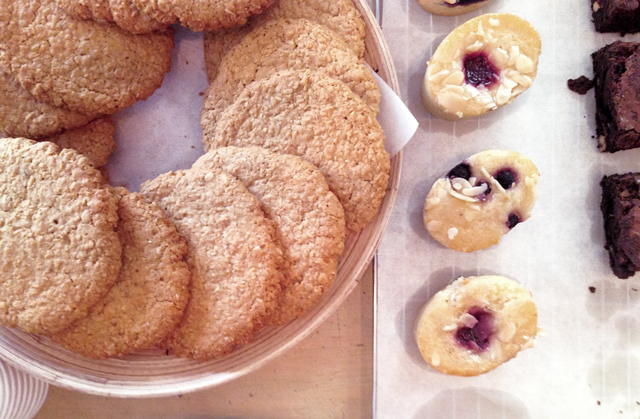 This is where that Ella’s Kitchen pouch comes in handy! I’ve waxed lyrical about Koi Ramen’s pork tonkotsu in a creamy broth before – check out its new home at POP Brixton and slurp on the best noodles in town. *Check out the Colombian place at the end of Pope’s Road for the biggest pork scratchings you’ll ever see! Brixton’s multicultural community and strong trading culture have made the area a great spot to shop for fresh ingredients and amazing deli items. Pick up your fresh herbs, olive, sourdough and the best taramasalata in town from The Continental Delicatessen on Atlantic Road; and fantastic fresh seafood from the fishmonger a few doors up, which has been around for 50 years. 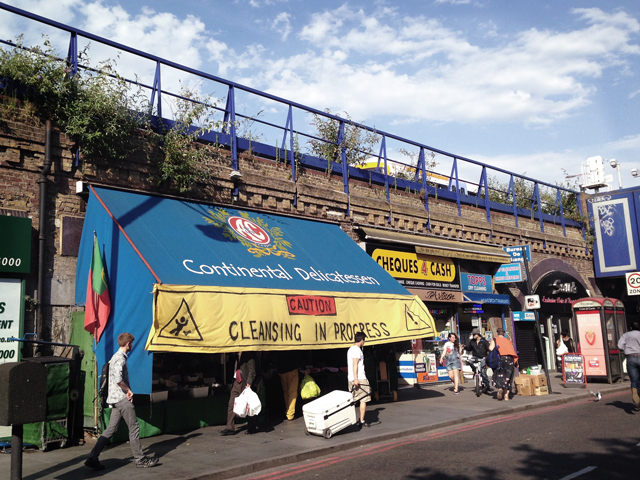 Sadly, the independent shops in the railway arches on Brixton’s Atlantic Road are under threat of closure thanks to Network Rail planning a ‘facelift’ to the area. 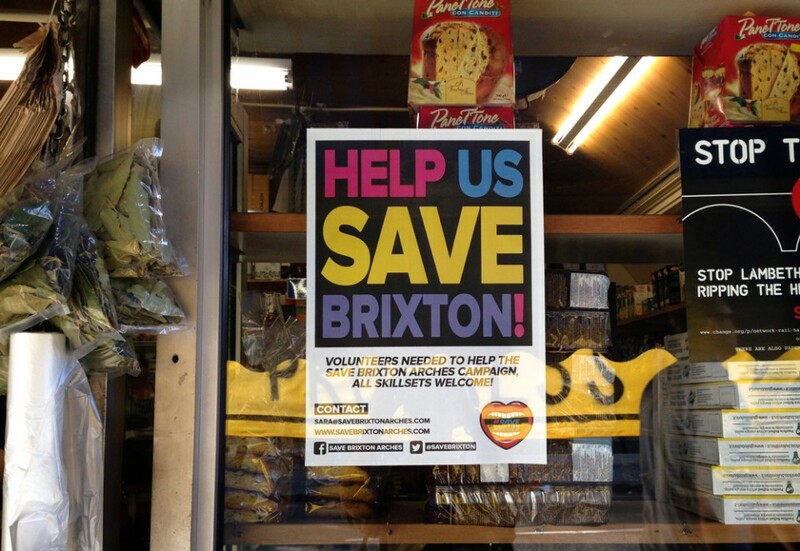 So support these guys before they go – Brixton won’t be the same without them! Okay first things first: for some shopping that comes under the practical parenting category, there are two destinations on Brixton Station Road to add to your itinerary: Mothercare (beware the so-so service) and H&M (which carries quite an impressive range of the baby and kids’ clothes, but turns into a mess with an hour of opening). But push on to Brixton Village and you can find great enamelware, and technicolour tea towels and trays by South London designer Jonna Saarinen at Brixton Cornercopia Homestore; cool eco-friendly fashion at The Keep Boutique; locally made treasures at Circus; and all things handmade, quirky and covetable at my most favourite little store on Earth, Brixi. A note for the dedicated shopper: Brixi is a tight squeeze and if you’ve come with a buggy and it isn’t busy, owner Emy will graciously let you bring the whole kit and kaboodle inside for a browse – but you’ll have a much better time popping in and out of the shops in Brixton Village if you’re wearing your bub in a baby carrier. 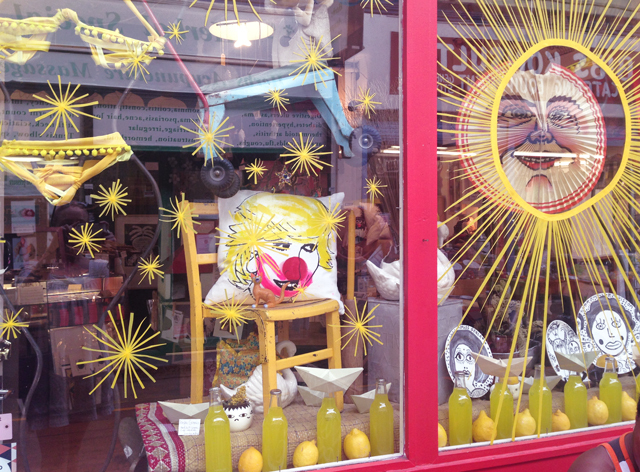 Brixi in Brixton Village: London’s best little shop for treasure hunting. 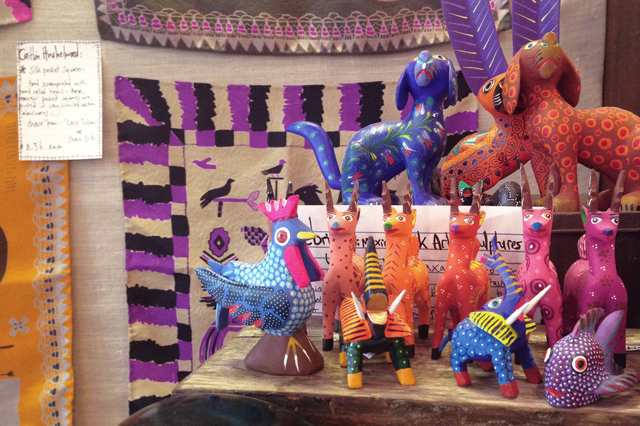 Bright and beautiful goodies at Brixi. 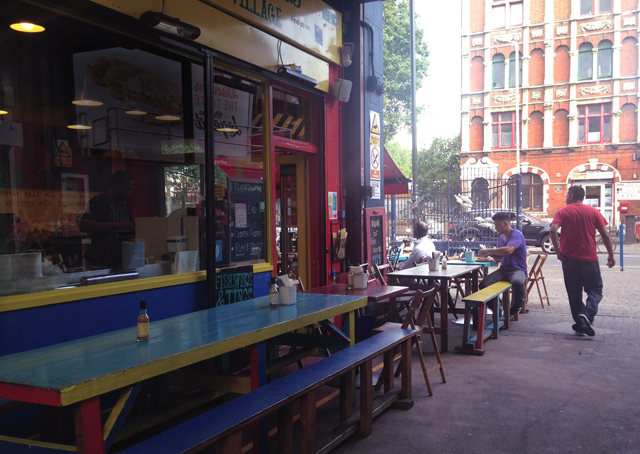 Wahaca – woohoo, perhaps Brixton’s first restaurant with a change table! Now this is how you do Mexican for mamas. 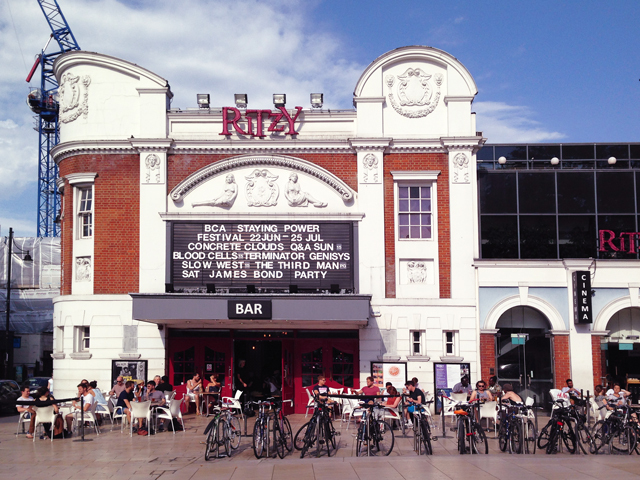 Ritzy Picture House – mums change their babies on the seats and in the aisles during the screening; if you can’t beat them, join them. There’s also a change table in the disabled toilet, but get there quick because a queue starts as soon as the film is over. Morley’s – thank goodness for this department store on Brixton High Street; you’ll find the nappy change facilities on level 2. Mothercare – ask the staff to let you into the baby-changing room; I always felt more entitled to use the space if I was buying something. Grab something off the shelf and pretend you are, if you must. Everything I have mentioned here is within walking distance of the tube station. Tube: If you’re bringing the buggy, travel by tube is slightly less painful: Brixton station has a lift! And, as it’s at the end of the Victoria Line, you’re guaranteed a seat on the way back out. Overground: You can get the overground from Victoria, but there are stairs to get down to street level. Bus: There are loads of routes that stop by Lambeth Town Hall or Brixton Station Road. Hop on the 35 or 133 from East London, the 37 or 345 from West London and the 2, 3 or 159 from the centre of town, plus many more depending on where you’re coming from. Or look it up on the Transport For London website.